From keeping your son off the streets and out of pool rooms to learning the use of his hands and mind for designing, building, and operating radio, John T. Frye, later of "Carl & Jerry" authorship fame in Popular Electronics magazine, offers no less than eight good reasons why a man should encourage his son (and/or daughter) to take up amateur radio as a hobby - preferably one that will last a lifetime. As is true with any activity that requires a person to exercise hand-eye coordination and think logically about the order and method for best accomplishing a task, Ham radio offers the complete gambit of life skills that should be nurtured at an early age. In the same manner a musician benefits mightily from learning to read and play music while the brain is still in the process of wiring itself with specific neural connections that make certain tasks more natural, a kid who learns to build, finish, adjust, and operate electronics or model airplanes, or to perform acrobatics, sports, and similar activities will possess a significant advantage over the vast majority of people who decide later in life to adopt that activity. Parents, now is the time to get started on little Jack or Jill; they will thank you later. The author discusses the many valuable things that the study of radio will do for young men. Hello there, Dad! I hope that you will not mind my calling you that; I am so used to hearing that boy of yours say "dad" that it seems to come rather natural. You see, I am the radio amateur with whom your kid has been spending most of his time lately. The boy tells me that you are none too enthusiastic about his new interest in radio; and, since I am chiefly responsible for his becoming interested in the game, I thought that I had better drop around and have a talk with you. If I cannot cause you to change your mind about Jack's new hobby, I shall have to try and undo the damage I have done. After all, he is your son; and it is your privilege to rear him as you see fit. If you cling to your aversion for amateur radio, I do not think that you will have any trouble with Jack. He has a great deal of respect for your opinion. While he is all up in the air about becoming an amateur, if you say drop it, he will drop it. He reasons that if you do not want him to take up the hobby there must be something radically wrong with it. By the way, just what are your reasons for not wanting him to go ahead with the game? Oh yes, I see. You are afraid that it will cost him too much money; that it will take his mind off his school studies; and that it will end up by his becoming a regular radio "nut." Well, those are good, hard business reasons such as I should expect from a business man like yourself. I shall attempt to answer them in the same businesslike manner. In the first place, let us take the matter of cost. You say that it will cost too much. Do you know that my first radio station, including both transmitter and receiver, was built for less than five dollars? 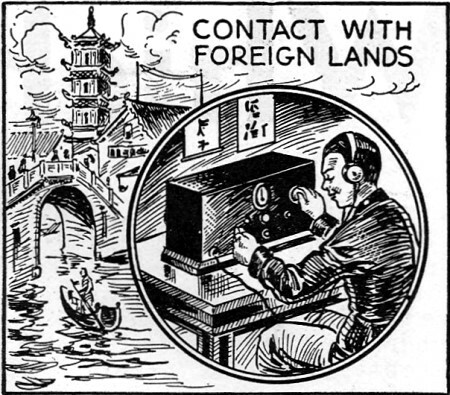 Yet, with that little station, I consistently talked with other amateurs a thousand miles away! Surely, you do not consider five dollars an exorbitant price to pay for a year's entertainment and instruction. From another point of view, a thing costs too much only when the buyer pays more than it is worth. Let us take a glance at what this "amateur game" is going to do for your boy! Then we shall be in a better position to judge whether or not it will be worth the money he puts into it. I always thought that that old "saw" about an idle mind being the Devil's workshop contained a-good-bit of common sense. Let me tell you a little incident that I saw the other evening. I dropped into the corner drug store for a soda, and while I was sitting there, two boys came in and stopped at the magazine rack. 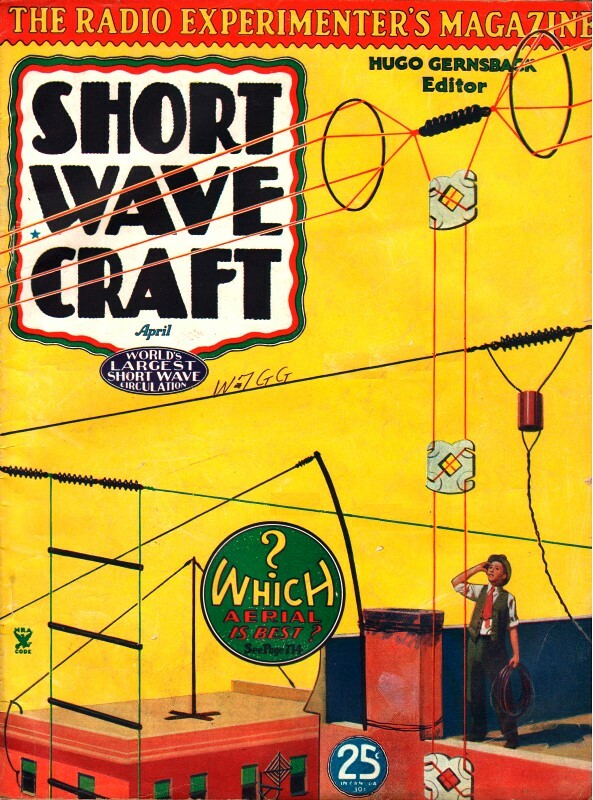 One of them made a grab for Short Wave Craft and began to scan the pages avidly. The other loitered for some time without picking up any magazine; then, when he thought no one was watching him, he furtively snatched up one of those "rags" that specialize in pornographic pictures and smutty jokes. Which one of those boys would you rather have for a son? If amateur radio can give Jack something to keep his mind occupied, it will do him a service of incalculable value. 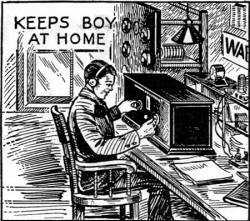 "Ham" Radio Keeps Boy at Home! Another thing that must be marked up to the credit of the amateur game is the fact that it keeps the boy at home, off the streets, and out of pool rooms. You might just as well face this fact: when your boy is home, he is under your influence; when he is away from home, you do not know whose influence he is under. There are too many boys who regard the ancestral roof-tree as merely a sort of refueling and rest station! I know several fathers who would consider almost any price a good investment if it would insure their son's presence around the house. Evenings are the best times for radio operation, and I am sure that you will discover Jack will spend the greater number of his evenings right here in the house if he becomes an amateur. Then, too, amateur radio is a great "teacher!" In the first place, it teaches responsibility. The amateur is licensed by the Federal government, and he is required to observe the rules and regulations of radio communication. He is made to realize that he is held strictly responsible for all the activities of his particular station. At the same time, the keeping of schedules and the handling of messages augment this feeling of responsibility. "Traffic handling" is a great instructor in punctuality, exactness, and dispatch. One of the first things that Jack will learn is that he must use his head and his hands if he is going to do anything in the amateur game. Of the fifty thousand amateurs in the United States, no two of them are confronted with exactly the same problems. Radio, ,as does any modern science, demands the ability to reason clearly and logically. The building of a receiver, the ironing out of the "bugs" in a transmitter, and the erection of a good antenna are literally "hotbeds" of problems in radio theory. These problems must be met and conquered by a combination of theoretical knowledge and clean, sharp reasoning! Once the problems of theory are solved, the amateur is confronted by new problems of actual construction. He knows that his station will have to undergo the most exacting scrutiny at the hands of fellow amateurs, and he wishes to make it as neat, as convenient, and as efficient as it lies in his power to make it. In other words, his skill as a workman is "challenged"; and I could take you on a tour of amateur stations that would convince you how marvelously some amateurs meet this challenge! In addition to teaching him to use his head and hands, amateur radio performs still another service for the amateur. It gives him a concrete "objective" for which to work, and it teaches him to expend the fruits of his labors wisely and carefully. I know a particular case of a boy who refused to work at any of the tasks that are are usually depended upon for supplying a boy with "pocket money." Distributing newspapers, running errands, selling magazines, and all other suggestions left him unenthusiastic. Then he became interested in "radio"! At once, his character underwent a marvelous change. He threw off his lethargy and became one of the most "industrious" boys in the town. He passed papers, sold magazines, ran errands, mowed lawns, and did a number of things to earn money that showed remarkable ingenuity and business acumen on his part. What was the reason for the change? Why the boy had a need for money. He looked upon his jobs in terms of transformers, tubes, and condensers. Money, to him, took on an entirely new meaning. For the first time, he understood that economic phrase "a medium of exchange." The lesson that the lad learns from the expenditure of his money is almost as valuable as any of the other services of the hobby. He learns to spend his money in a manner which will give him the greatest return. It does not take an amateur long to realize that all catalogue bargains are not what they seem. He learns to compare prices and values, to select equipment with an eye to the future enlargement of his station, and to distinguish between actual quality and advertising propaganda. It is not unusual sight to see an amateur poring over half a score of catalogues in order to secure the best price on a particular piece of needed apparatus. Finally, we come to a service, that, although it does not possess the tangibility of the former listed services, has all of their importance. Do you know what it was that made the lad of a few decades ago run away to sea? It was the same urge which prompts the modern lad to hitch-hike" across the country - an innate craving for adventure, for new experiences. Amateur radio furnishes a safe outlet for this desire; flinging messages across thousands of miles of spaces, chatting with fellow amateurs in the far corners of the earth, sending the spoken word into faraway homes, exploring the mysteries of the ultra-short waves, all of these things spell thrilling adventure to the youth of today. Why that is the factor that makes the hobby so fascinating to the boys from seven to seventy. They are given a chance to do things which they never did before; they are permitted to talk to people whom they will never see. Amateur radio has given them a key to a "magic world" of modern science, and they revel in their esoteric delights. To sum up what we have been talking about, we may expect amateur radio to do these things for Jack: It will keep him busy at home rather than loafing about on the streets. It will give him something to do with his head and his hands and will encourage him to use his faculties to the very limit of their power. It will teach him habits of punctuality, tenacity, and efficiency. It will instill in him a sense of responsibility and will make him resourceful and self-reliant. It will encourage him to work for his spending money and will give him experience in the wise spending of his funds. It will give to him that breath of adventure and romance that will satisfy his boyish craving for these qualities. Honestly, can you really believe that any price in terms of mere dollars and cents is too much to pay for an array of character-building services such as those listed above? Let us now take up your second objection: You say that you are afraid that the hobby will take the boy's mind off his school lessons. I am going to admit quite frankly that there is that possibility in the case of a boy who goes his own way, with absolutely no guidance from his parents. Happily, in Jack's particular case, this danger is not present. You know that a boy has an "immense amount of enthusiasm" and that he is likely to plunge into anything he does with his whole body and soul. There is where your steadying hand will be needed. Rightly controlled, Jack's interest in radio can be used as an impetus to scholastic endeavor rather than detriment. Let me explain what I mean. Radio is a science, and it requires a knowledge of mathematics that goes quite a bit beyond the learning of multiplication. Jack will soon find himself up against formulae that will require a more than superficial acquaintance with the higher branches of mathematics. A knowledge of physics is nearly indispensable for the radio amateur. Light and sound are so closely related to electricity that a knowledge of the principles of all three should be in the mental quiver of the conscientious amateur. Chemistry, too, will prove to be a basic science for this new hobby. You have only to point out these facts to Jack and you will find him viewing these subjects with an entirely new interest. Encourage him to approach his hobby from a scientific angle. Make him desire to know the why as soon as he has learned the how. Let him learn the thrill of being able to forecast exactly how his apparatus will function even before he assembles the parts. It is only natural that he will take a greater interest in the affairs of the world when he is in daily communication with amateurs in all parts of the globe. You will find him poring over maps in search of out-of-the-way countries, and he'll nonchalantly speak of outlandish little principalities that are halfway around the globe, as though they were in the next state. His horizon will be enlarged; geography will assume a reality that it never possessed before. Finally, I may point out a fact that every parent knows and uses. A boy's "hobby" places in the hands of his father and mother a powerful tool with which to shape the lad's activities. The exercise of the hobby can be bestowed as a reward for commendable action, and the denial of this privilege can be used as a form of punishment. For instance, suppose that you tell Jack that he may "radio" as much as he pleases after he has finished his homework! Why not offer to buy him a new "bottle" - the Ham designation of a tube, sir-if he makes an average of B? You'll find that such methods will achieve marvelous results! No Danger of Son Becoming Radio "Nut"
The third of your objections was expressed in, the fear that Jack would become a radio "nut." I know what you mean. You think that perhaps he will become unbalanced and will be able to think only on radio. I have seen that type of individual, and I know what a bore he is. Monomania is just as much a form of insanity as any of the less common types. If I thought that there was any danger of Jack falling into that particular pitfall, I should be even more strongly opposed than you, to his taking up amateur radio. However, I am not in the least worried about, his becoming a "nut." My faith is based on a knowledge of the boy and his habits. He likes outdoor sports; he is good in athletics; you and he go on hunting and fishing trips; he has a host of friends who are constantly demanding his company; and he enjoys the social gatherings of his crowds. In the face of all these varied interests, why do you fear his becoming unbalanced? Depend upon it: that healthy young body of his will demand exercise and activity that will not be satisfied by the pursuit of his hobby. In fact, the hobby will , really balance up his life. At the present time, there is too strong an accent on the lazy, careless seeking for entertainment. Nothing the boy does builds toward a definite achievement by which he can measure, his progress. This new hobby will inject a note of serious study and painstaking construction into his present butterfly existence. His completed station will be something that he can show to his friends with that pleasant glow of pride which arises from a knowledge of work well done. Candidly, sir, I should dislike to take the responsibility of discouraging a boy's interest in any scientific line. Who knows what may come of his enthusiasm. 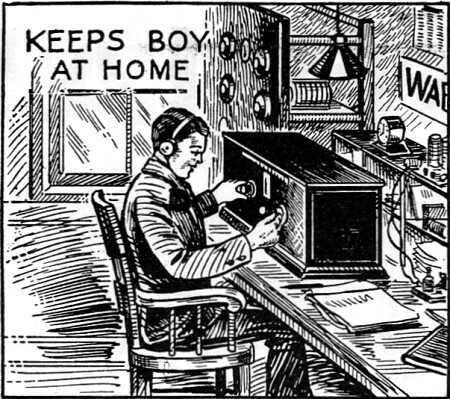 Edison's interest in chemistry, Ford's interest in machinery, and Marconi's interest in radio were all, at one time, hobbies. Perhaps this boyish liking for radio may be a signpost of the lad's destiny. At least, it betokens a mental alertness, a healthy desire for knowledge on the part of Jack that I should welcome with the greatest happiness if I were his father. Give me a boy who asks questions, who experiments, and who takes a keen interest in his hobby. That boy has the foundation for a successful life. He is awake, and his brain "absorbs knowledge as a sponge does water"! I know some boys who go through life with a dull apathetic attitude that is entirely devoid of enthusiasm. Nothing stirs them; nothing arouses their interest. They have only scorn for others who become excited over a hobby. Would you prefer that Jack be one of those fellows? Well, Dad, I think that about winds up my little speech; I have tried to be perfectly honest in showing you what I believe to be the advantages of this amateur radio game, and what I have told you is based on my own observation and experience. I have showed you what the hobby has to offer the boy, and now I should like to add just one more point. Amateur radio is one hobby that can grow up with the youth. It offers the adult as much as it does the high school boy. From a simple knowledge of fundamental principles, the amateur can climb upward until he has mastered the intricacies of technical theory. From there, he can set forth, intrepidly into the unexplored reaches of its various fields. Radio is new enough that it holds forth unparalleled opportunities for the radio experimenter. Ultra-short waves, television, power transmission, and pathological application are but a few of the many fields that beckon the experimenter. Amateur radio might truly be said to be "all things to all men"! The amateur may expend as much money and as much time as he desires upon his hobby with the assurance that he will receive the greatest possible return in pleasure and instruction for his expenditure. The game has a dozen and one different branches from which the amateur may select his particular form of activity. Code transmission, 'phone transmission, television, "DX" hunting, five meter experimenting, traffic handling, and equipment design are a few of the branches of which I speak. Surely one of these will prove attractive to any person who is interested in the science of radio in any form. There you are! My argument is complete! The decision is now in your hands. Will you permit that boy of yours to go ahead with his hobby?